The finished basket will measure approximately 9″ in diameter and 4.5″ tall. Please note that sizing may vary slightly if your gauge does not match mine. This crochet basket pattern begins by working a flat round piece for the bottom, continues in the basket weave pattern to form the sides and finishes the handles in single crochet. The basket weave pattern may look slightly complicated in the written form if you are new to crochet or reading patterns. I recommend taking a look at the basket weave stitch tutorial to familiarize yourself with the stitch. It’s actually much easier than you may think! 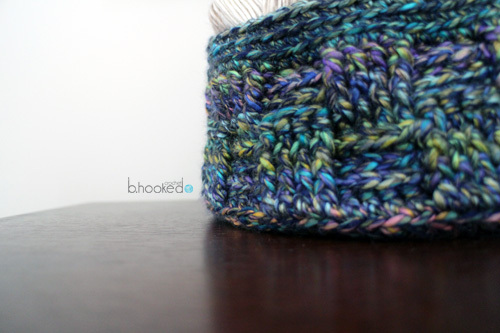 Don’t be intimidated by working the basket weave stitch in the round. It’s not nearly as difficult as you might think to adjust the pattern. Your chain 3 at the beginning of the basket weave pattern (round 9 in this case) will act as a double crochet, so don’t forget to count it as such. You will join with a slst to the second chain for every round. 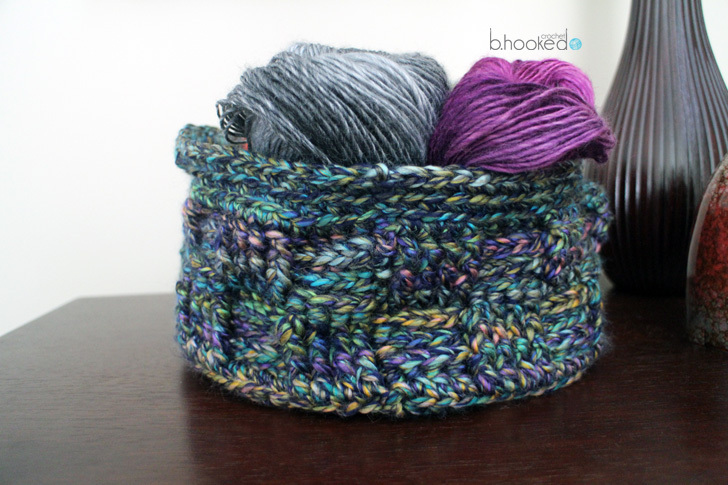 This is a great project to challenge yourself if you’ve never worked this stitch in the round before! Round 10: Ch 2, and *Fpdc around the post of each of next 4 sts, Bpdc around the post of each of next 4 sts. Repeat from * around and end with a BpDc around your chain 3. Join with a slst to the 2nd chain. Round 11: Ch 2, and Fpdc around the post of next 4 sts, Bpdc around the post of each of next 4 sts. Repeat from * around and join with a slst to the 2nd chain. Round 12: Ch 2, and *Fpdc around the post of each of next 4 sts, Bpdc around the post of each of next 4 sts. Repeat from * around and join with a slst to the 2nd chain. Round 13: Ch 2, and *Bpdc around the post of each of next 4 Fpdc, Fpdc around the post of each of next 4 Bpdc. Repeat from * around and join with a slst to the 2nd chain. Round 14: Ch 2, and Bpdc around the post of next 4 sts, Fpdc around the post of each of next 4 sts. Repeat from * around and join with a slst to the 2nd chain. Round 15: Ch 2, and *Bpdc around the post of each of next 4 sts, Fpdc around the post of each of next 4 sts. Repeat from * around and join with a slst to the 2nd chain. Round 16: Ch 2, and Bpdc around the post of next 4 sts, Fpdc around the post of each of next 4 sts. Repeat from * around and join with a slst to the 2nd chain. Round 18: Ch 1 (counts as stitch). In the blo, Sc once into each of the next 13 sts. Ch 12, skip 12 stitches. Sc in the blo of the next 28 sts. Ch 12, skip 12 stitches. Sc in the blo of the remaining 14 sts. Join with a slst to the first chain.